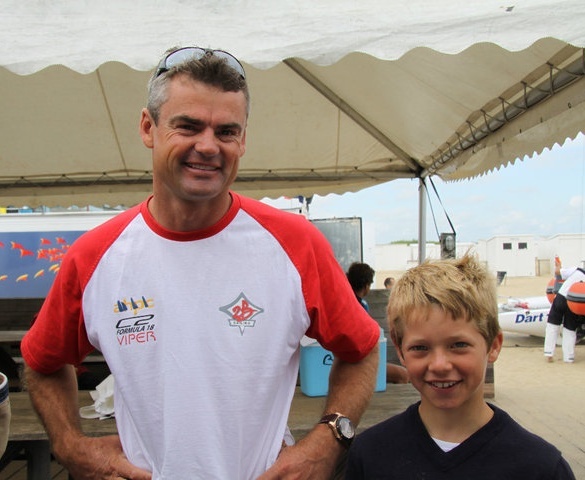 F18 Youth WChamps, Charles Hainneville & David Fanouillere won the French Raid Nats at Erquy. Expect more from them at LA. 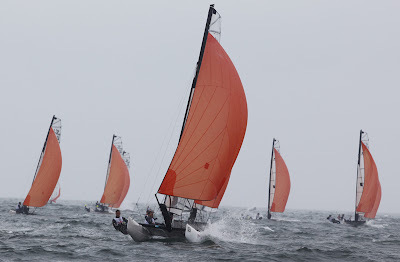 News on Charles AC45Youth team later.Images CVBE, Selection on FB. Top ten below, Full Results here. Photo: Chris Cameron. 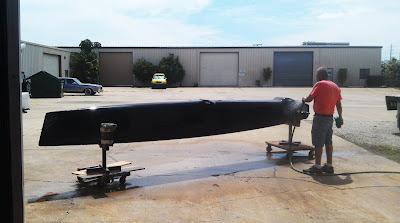 Some tow in made previously but finally they set full Wing. 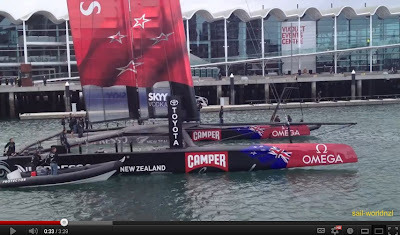 Report at Emirates Team New Zealand Blog. Bow trimmed up as designed, want to see how it reacts to +20 gusts, its going to be interesting to see if this concept is used by others. Good video to see how these multis ride, including Dirty Deeds, featured once. This is what all will need to sail here in a few years as the river is geting dry, although the learning curve will be steep. Maybe Tris will catch better. 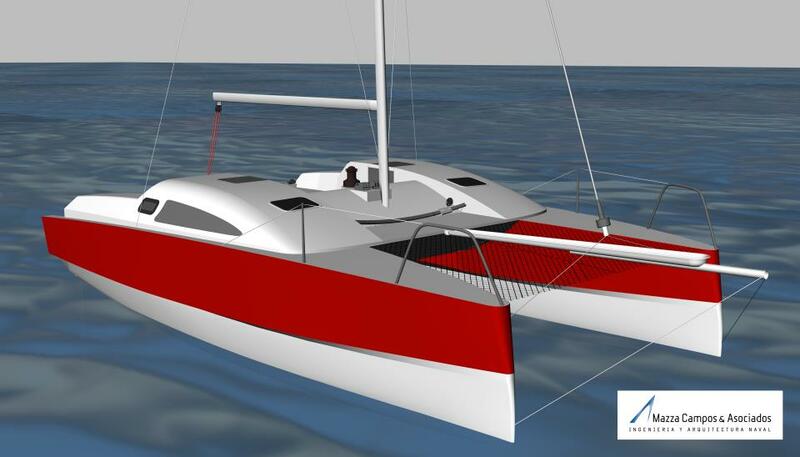 One Multi 23 has been imported and a small cruising cat project is on the table too, the 'Castero', by local designer Sebastian Mazza, and local F18 sailor Lucas Gonzalez Smith. 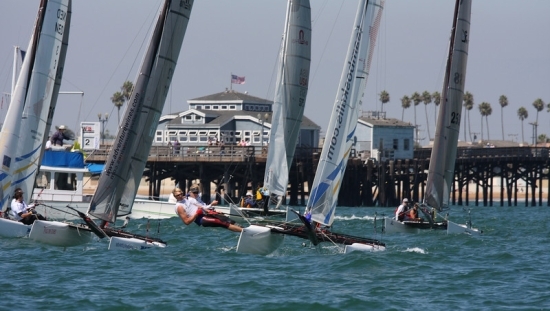 Photo: Jeremy Leonard/SurfCityRacing - F18 North Americans 2009 @ABYC. Save 150usd from the entry fee registering previous August 1st. us350 now, us500 later. All the top Guns confirmed: Bundock, Heemskerk, Brouwer (Bid 2012), Backes, Styles (Dark Horse 2012), Larsen, Bissaro (for France???). 93 Already in and I know of some french Aus and Us sailor still missing. 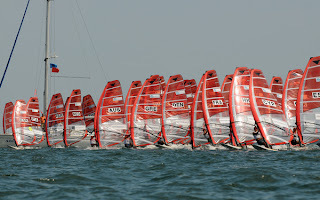 Also Coen deKoning-Thijs Visser , I think they are going too. 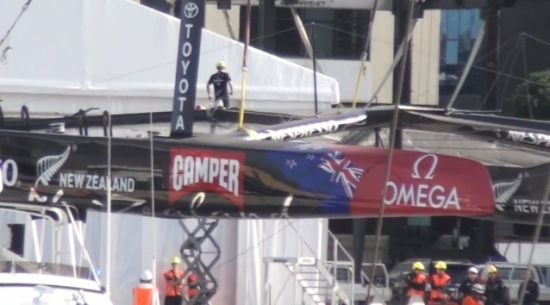 Oracle Design Team member, Mike Drummond is going too, maybe with a scaled AC72 hull for testing as he did (I guess) with an A in NZ?.. A Cat sailors, with three months remaining before the start of the 2012 world championships we have just received the 87th entry. Thank you to those who have entered early. Please note your name will not appear on the Worlds’ website unless you have paid. For early entry discount time is running out! Registration is currently $285.00 USD and will increase to $435 USD on August 1st at 12.01am USA EDT.IMPORTANT You must pay as well as register prior to the August 1st deadline to be eligible for the $285 USD entry fee. 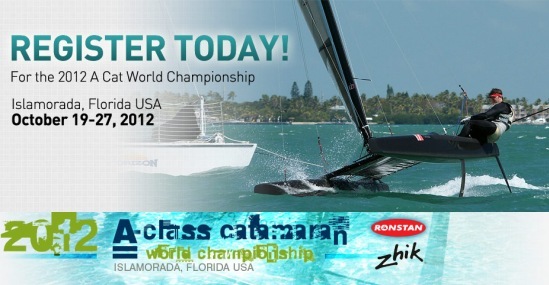 Save the $150 for A Cat gear and get registered and paid before August 1st ! If you think I'm a catsailing nuts fanatic, you should see me as a kid with surfing. The only reason I have a Catsailng site is cause BA has a huge open Rio de la Plata near by instead of an ocean. Although the rowing, wakeboarding, windsurfing & F18 Spi runs compensate a little for us when not travelling for waves or snow. Today seeing some JBay footage I remembered Andy Irons, then I checked his bio and he was born July 24 1978, so he would have been 34 just yesterday. You need talent to school Slater, and Irons had it, one of those deaths that hit you strong and makes you appreciate every day God gives you. Great image Tribute by Photographer Brian Bielmann . Some people at ISAF meetings are needing a special 'compass' to make their key decisions and votes. 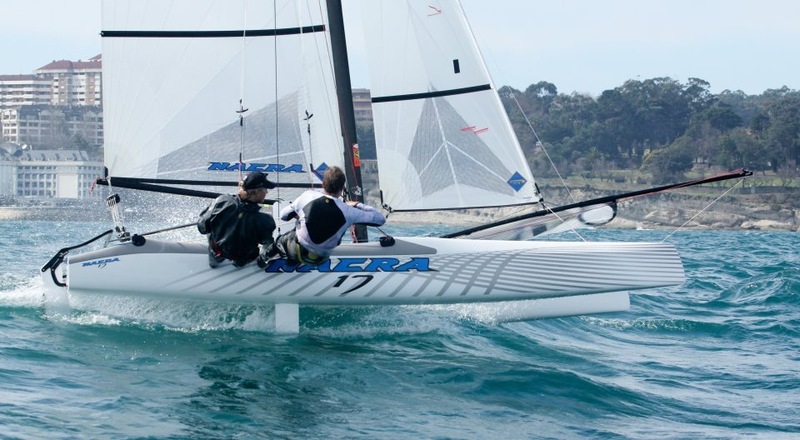 Of course I once said that future classes are going to be: - Multihull (F18, F16 women, A-Class), 49er, Moth , Kite, Board, Devoti One..! 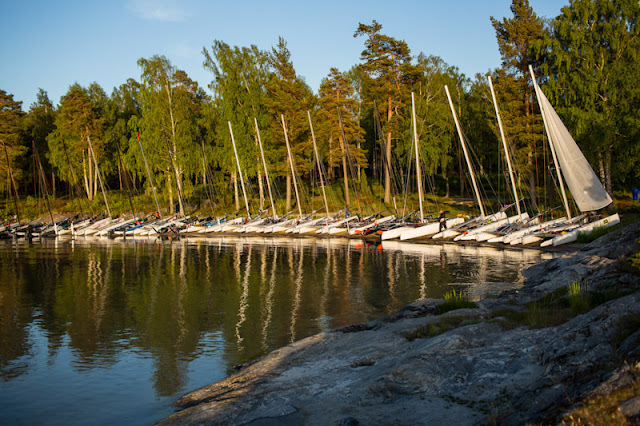 But it is a surrealistic scenario hearing some talking about "grass roots, sport development, emerging countries, local fleets and so on, and then these same people votes out one of the major youth programs world wide. Which is the big picture here? 1 step forward with Multis/Kites in and 2 backwards? Many people asking and searching in forums to enter the multihull world. The high exposition we are having with the AC is helping sailors to start turning their heads to multis in gral. And a good way to start is to get a good deal on the used market, these sales also push new acquisitions of previous owners going for the 2012 model. 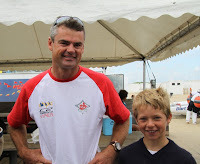 I posted this pic of Henri Demaesmaker with Bundy last year. 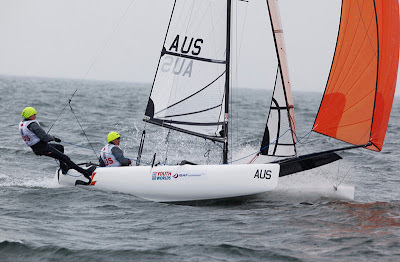 Bundy twitted then: "Today I sailed with Henri Demesmaeker the 2020 Gold Medallist.. remember this tweet!! " 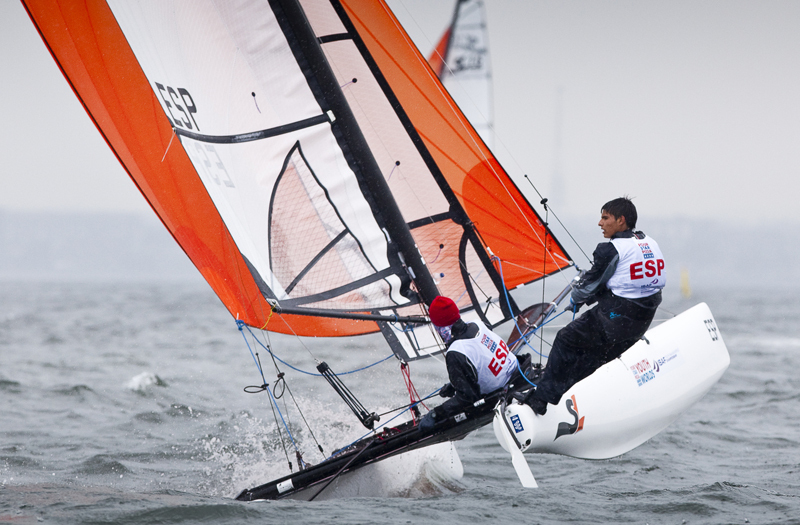 Henri and Philip Hendrickx ended 4th really close to the top, 4 points behind the 2nd. The British crew got the Gold 20pts ahead. 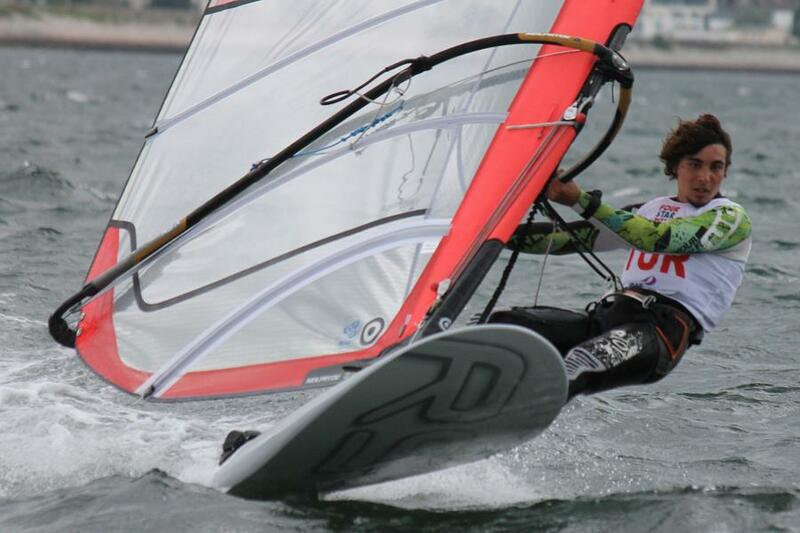 Good to have these kids racing and having fun on the SL16. 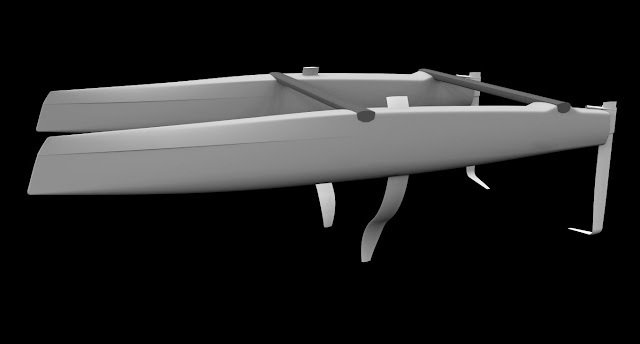 We didn´t have crews from Arg, we will try to get some for next year. Results below. 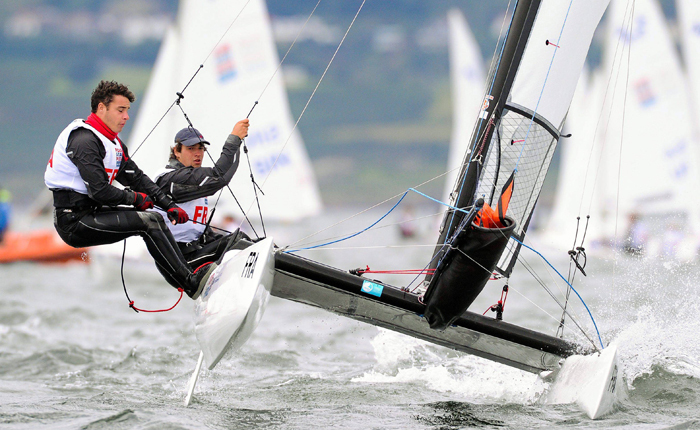 Photos: David Branigan/ ISAF. Gallery at CSN Fcbk. 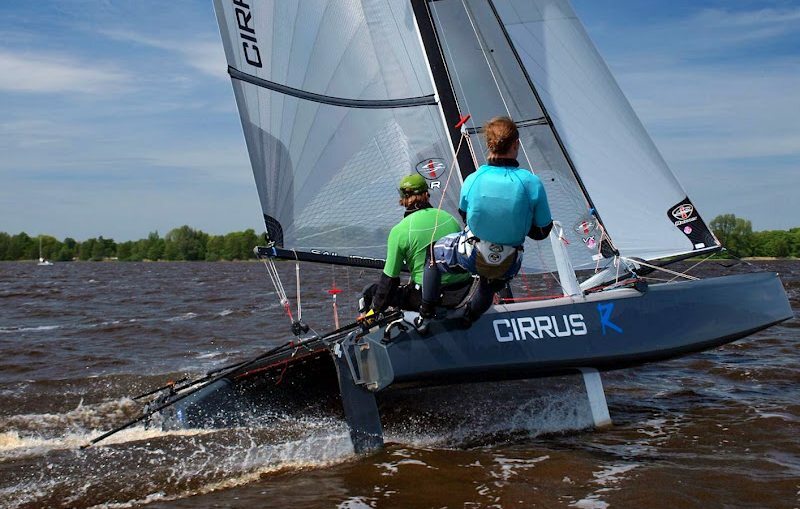 The Cirrus has prove to be a performer wining the Eurocat 2011 and being 2nd at Balaton. 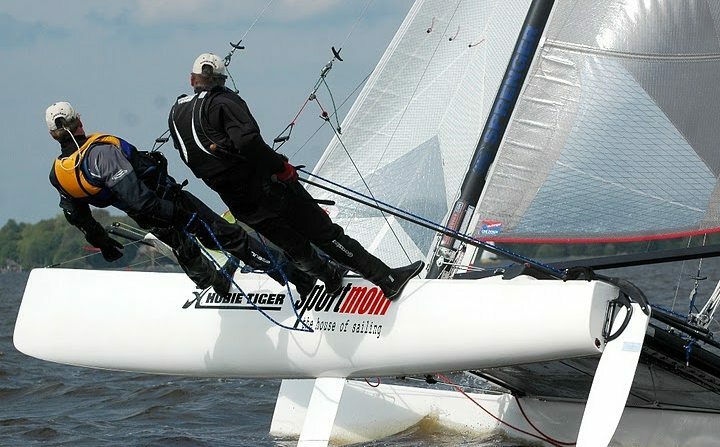 Also continues good performance from Heemskerk-Tentij and Casey-Tebo in the US. Extreme rocker at the bow a la Exploder F18 and recently the Cirrus R. These lines weren´t clear on land. I remember seeing a downwind video of an F18 going intense pitch motion with a similar shape, this is another ball game, another scale but for SF I would play safe as speed will be there on conditions only. 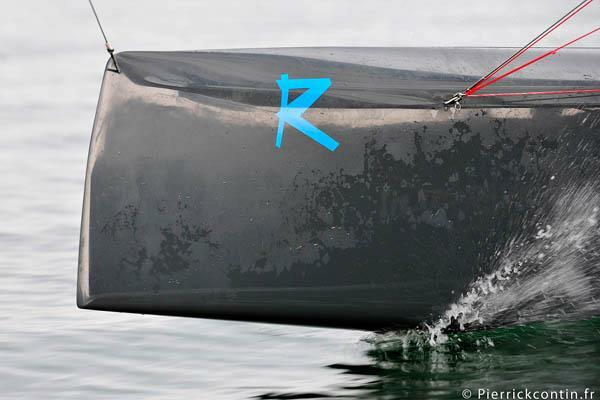 Remember how I didn´t like Alinghi 5 bow, and it showed at Valencia with some scary pitchs, although waves at SF will be different. 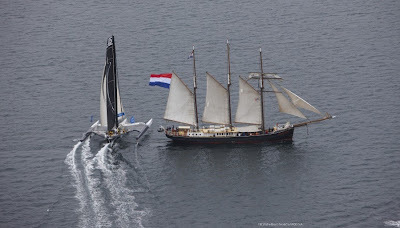 But I also thought the same for USA new amas and the AC45 and they worked quite well. We'll whichever the case, the lines look extreme. 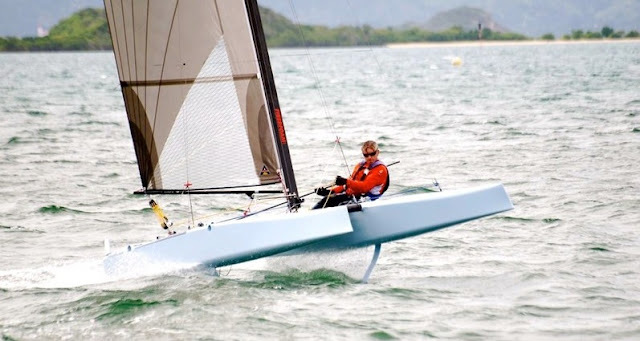 Check Pete Melvin (curently in NZ) Q&A by Jeremy Leonard at SailRevolution.com done while assembling the beast. Also daggers now visible, straight ones at this time, they have 10 choices through the entire campaign. 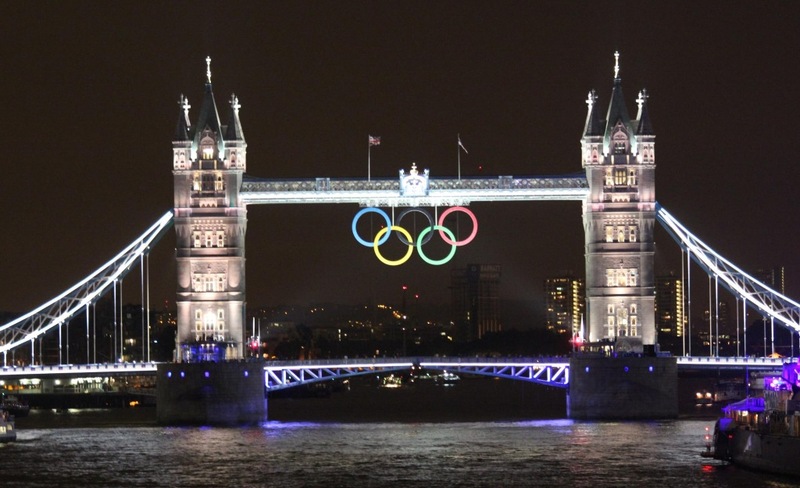 As we informed when it was launched here in CSN, this project was aimed to the Olympics. 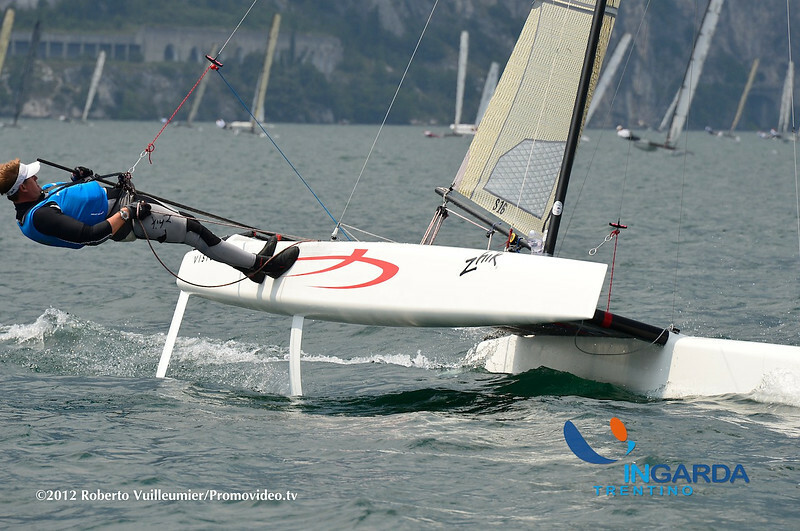 Based on Martin Fischer work to generate more lift and reduce wetted surface applied on his A-Class at Noumea, and later on the Mayfly. 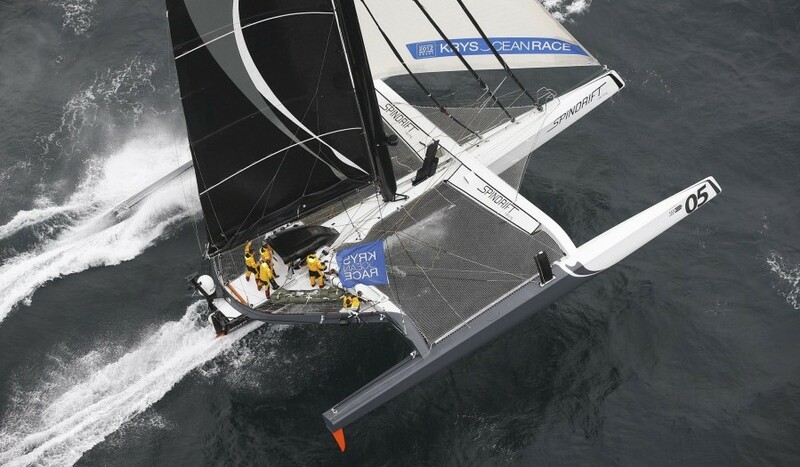 The great difference with this solution is that it is Not an 100% hydrofoil schema. 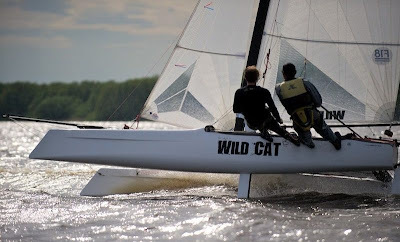 That is ""easy"" to achieve as demonstrated by several other beachcat projects. The Hard part here is having a platform capable to course race one on one against current top performance beachcats. Nothing radical at first glance, only detail is a super flat bottom section at the bow, and I think is the way to go aiming to unknown territory, that being a Winged 72 feet Cat, course Racing 40knots at San Francisco. 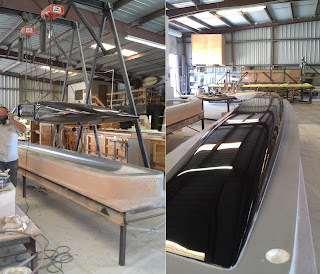 What we can´t see here yet, is the foil solution to be used. on a extreme pitching motion at Valencia, that platform couldn´t manage that power. 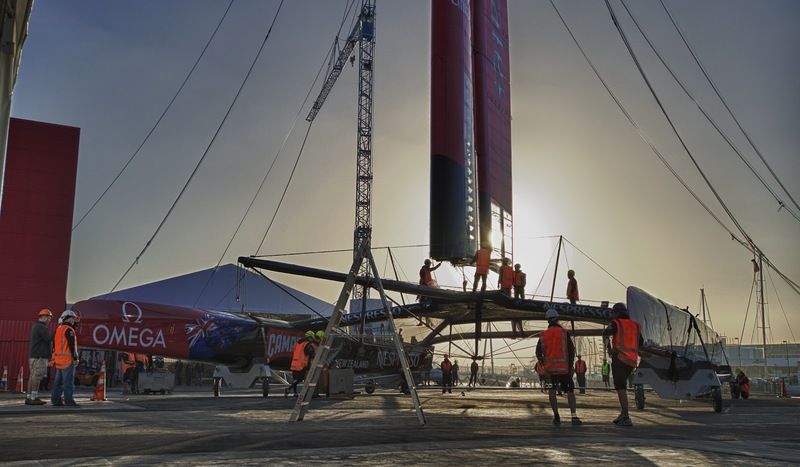 But this is a new generation hull shape, well proven at Ocean racing (BPV) and smaller cats, even the AC45 that served as a testing bed for all teams. Can´t comment much on the Wing, but it seems quite ""standard"" too. Will ask Steve Clark for feedback. I asked Glenn Ashby if he was going to do F18/A-Class Worlds and he say he was full on the AC72 launch, maybe he'll attend the As, hope he can go to LA too. You can´t go wrong with this AC72. 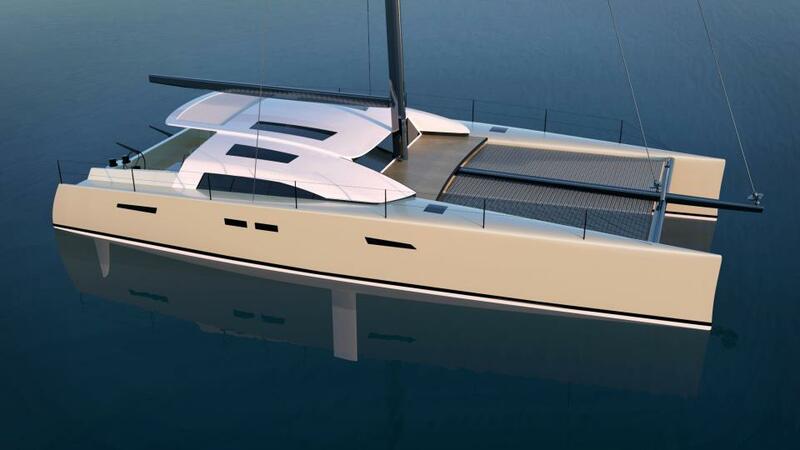 The Barker/Ashby combo and their team will push this beast to the limits. 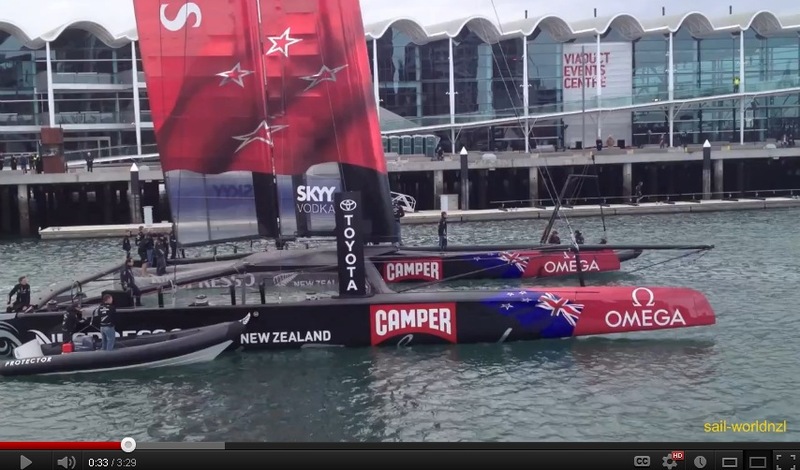 I've thought designed by MM, but it seems they are part of a bigger design team at ETNZ. Eastcoastpiersrace.com 25th East Coast Piers Race Sponsored by Wildwind Sailing Holidays. 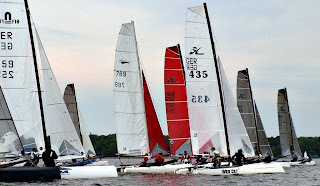 74 boats attended this year East Coast Piers Race sponsored by Wildwind at Marconi Sailing Club. 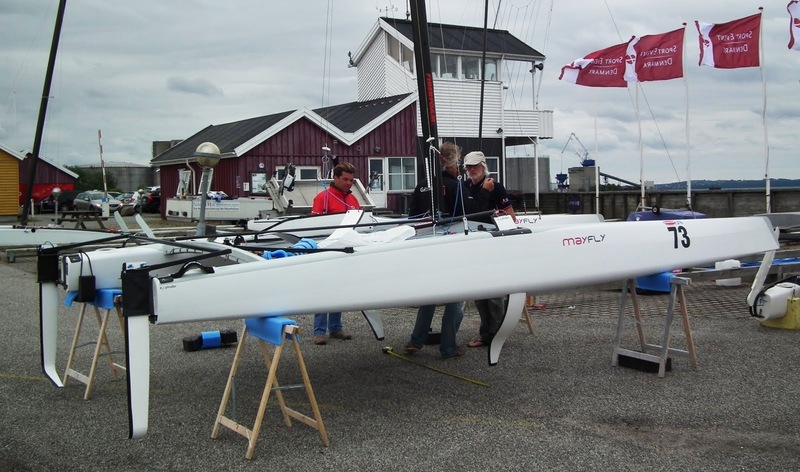 The race is organised by Marconi Sailing Club to raise money for The Cirdan Sailing Trust and the Essex Air Ambulance. 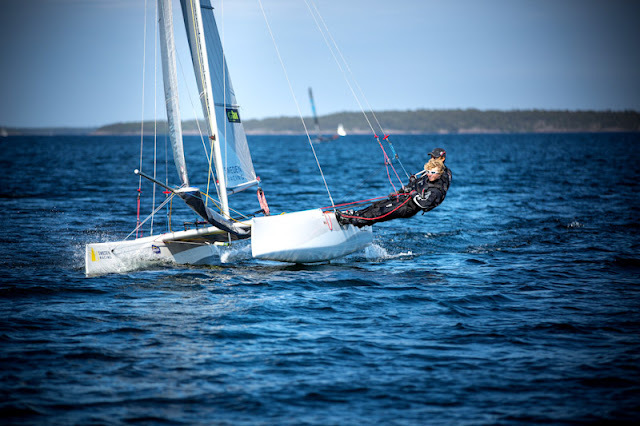 Rain and light winds greeted competitors on Saturday but thankfully Sunday saw excellent conditions with a perfect breeze and plenty of sunshine for the main events. 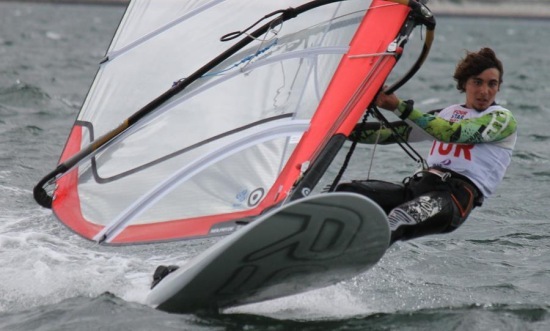 With this year being the 25th East Coast Piers Race, the organising team decided to open the shorter Colne Point race up to fast dinghies with a PY of 917 or faster. This attracted 7 dinghies from a variety of fleets. 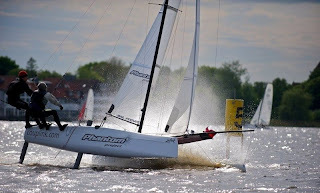 Two races were scheduled for Saturday with race officer Mike Turner setting two medium distance races so the competitors could become familiar with the river. The first course was to Bradwell baffle and back. A late wind shift before the start of the race lead to a downwind start and a car park at the first mark, the late starters got lucky taking a wide berth around and to the front of the fleet. The end of the race finished in style with a squall coming through the race course for the last 5 minutes knocking some boats straight over. 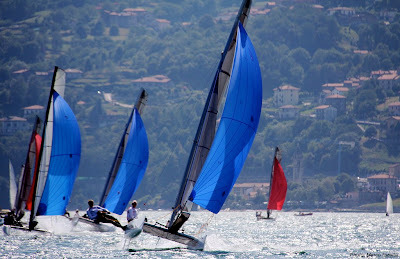 Analysing the A-class Vision after the EC 2012 at Lake Garda, Italy. "The Vision sailed into the top ranks at the EC and the basis for this great result was analysed which underlined what we hoped to find in the design stage. 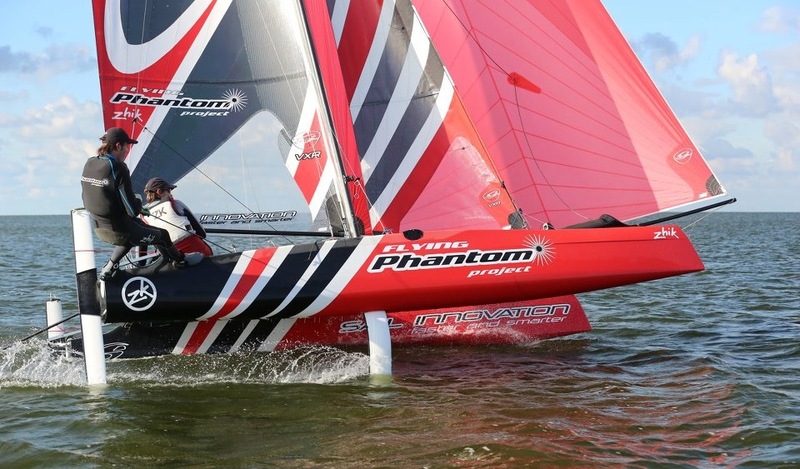 After the fine tuning done in the first year of its existence the Vision’s potential was shown in the German Championship with a 2nd place in light conditions and a 1st place in the French Nationals with more wind and high waves at La Rochelle leading up to this event. The Vision was having good speed upwind in all conditions and was a treat downwind. 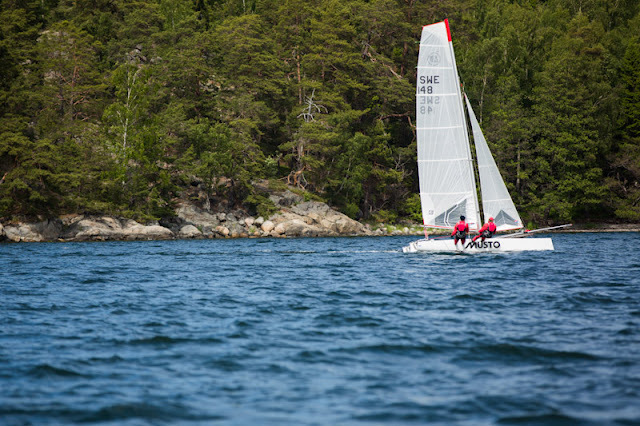 It allows you to have a wider choice of sailing. Of the starting line you can accelerate in a straight line, you hardly ever have to bear away to pick up speed and then to start pointing. This gives you an obvious advantage. After that you can go for speed or height. The balance of the Vision is very good on the curved boards. Tacking and gybing is very easy and quick in all wind conditions. And again the acceleration out of these manoeuvres gives an extra edge. 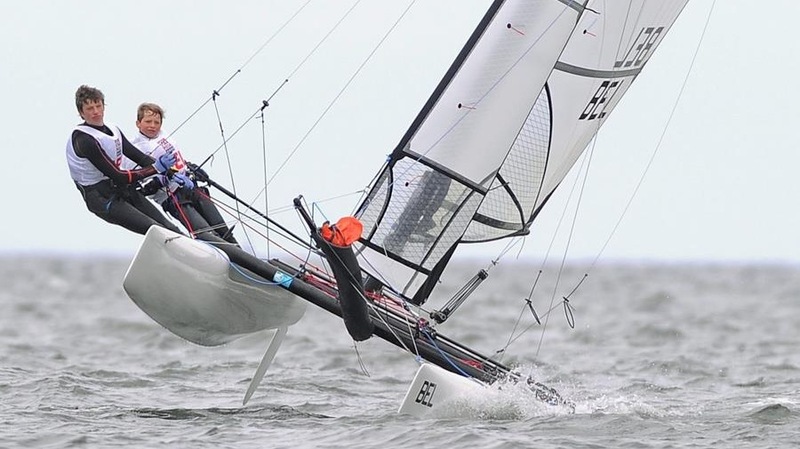 Brad had really bad luck on a hit, after winning two races the previous day. A pity as it would have been an interesting match for the crown with Landy and Chris. 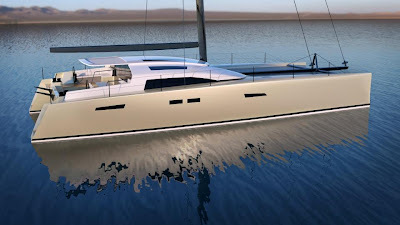 Dominik from Scheurer offered me a boat to sail I could not resist. Landenberger sails & FiberFoam supplied me with an extremely fast rig, & I thank them all for this opportunity. Prior to the stat of the Euros I managed to sail for a few hours to get on the pace. Going into the first race I was not to sure how I was going but new to be up the front you had to have good speed. You had to get good starts & hit the cliffs to get the good breeze. There were a lot of soft patches all over the course so you had to make sure you stayed on the outside lanes. Every race the boat was getting faster & faster & before to long I was one of the fastest boats on the course getting good starts & getting clean air was the key. 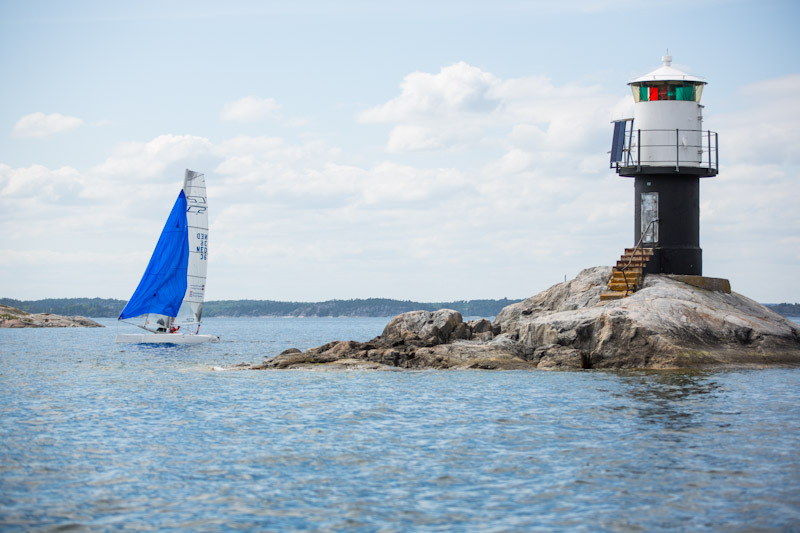 You had to find a good line on the start, tack on to port & hit the Cliff fast. 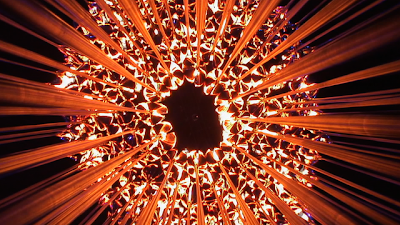 Dervio Team Race _Eng from FilMotion // Luca Carton on Vimeo. Mischa de Munck started this format with some friends last year. Lamberto Cesari attended to the 2012 edition and organized later one of his own at Dervio. A format that sailors seem to like and that is catching up. 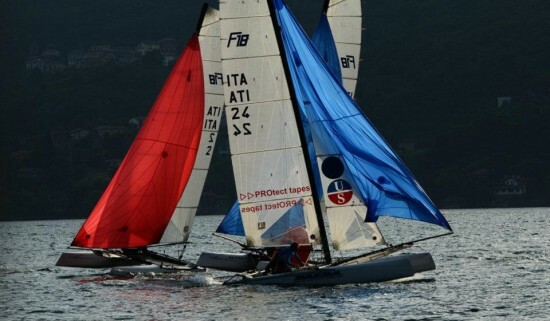 Congrats to Lamberto, ex rider for team Hobie Italy, now helping to promote the sport. Quite good edition on the video and reporting with eng subtitles. More images at CSN Fbck. "Great show at the 1st Dervio Teamrace on F18 Catamarans: the format tested at the Bolster Knockout worked out well in Italy (two against two regatta in a digital-N course, and the team with the last boat on the finish line loses) showing that sailing can be spectacular and close to the public. The spectators in Dervio enjoyed great team racing moves, since all the races were uncertain till the last meters. The championship was made of two semi-finals (Team White vs team Black , Team Red vs Team Blue), where the team winning two races had access to the final. 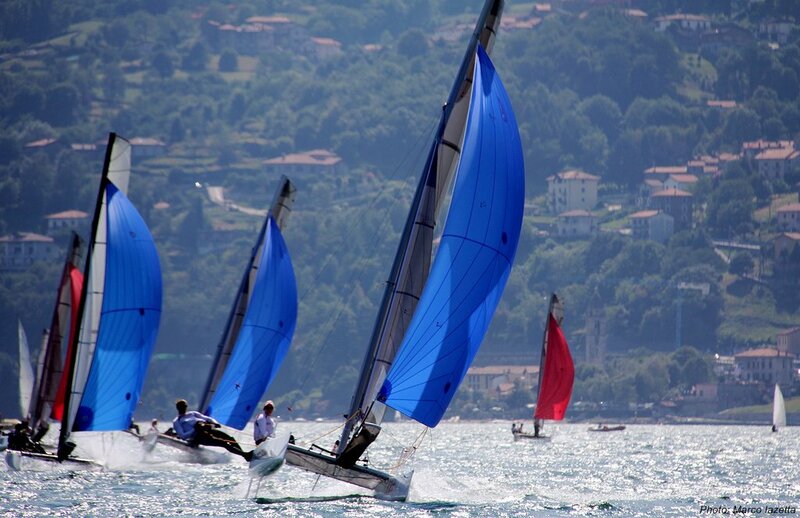 Both semi-finals has been so tough that were decided in the third race, giving Team White (Bissaro-De Paoli, Viganó-Viganó) the chance to win the final over Team Blue (Saragoni-Filippi -former LAC sailors- Mazzucchi-De Lorenzi). 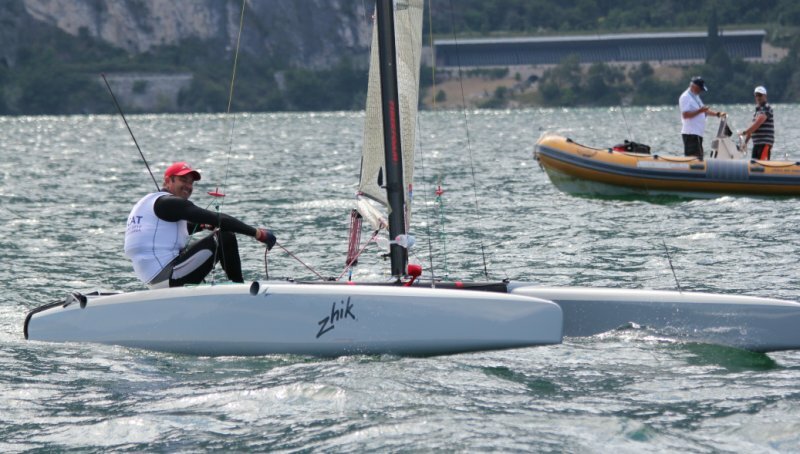 Good to see italian youth talents in the final (Viganò twins are 21 and Mazzucchi is 23), fighting with experienced sailors like Vittorio Bissaro (25, 3rd at Balaton Worlds last year) and Luca Saragoni (LAC finalist in 2003-2005). 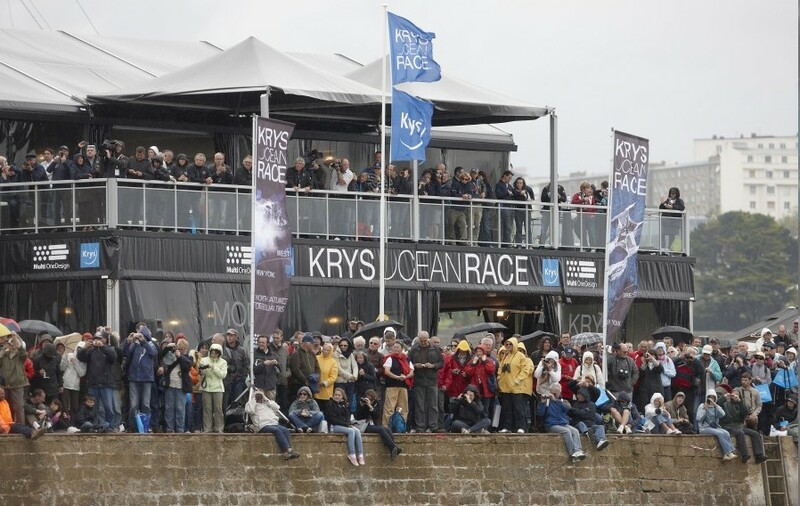 Everybody (sailors, spectators and jury) was enthusiastic about the format, and is asking for the next one. 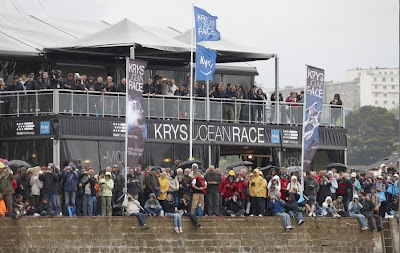 Why don´t we start thinking of a European Tour beside the biggest F18 races?" Falcon Marine F18, 1st pics. Good to see projects coming to reality. When Matt McDonald told me he was going to design and build an F18 I was quite pleased to know that North America will have again a local made alternative. 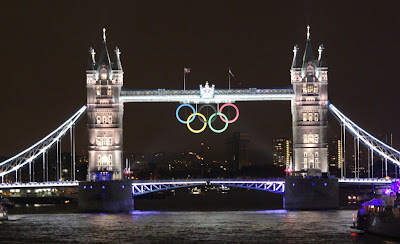 Thus reducing at first glance import costs, and providing also local support. Click images to enlarge. I will do a full report onsite with Matt in September. Later more pics of the entire platform when ready. Good volume, nice lines, just a Smooth ride for LA! Check more images at CSN Fb. Great Nordic raid, attracting all for the good times and scenery, high quality images by Strandell also helps! Left: Gosche/Pegel on their Hobie Wildcat lead German ranking 2012 after Kieler-Woche. More boats, more alternatives for sailors. 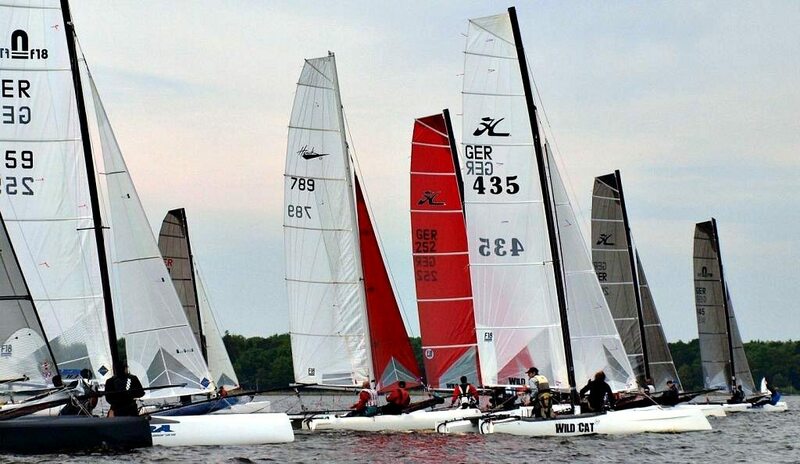 The German fleet gathers oldies like a Hawk, or the Tiger with the latest designs like Cirrus or Phantom. Next event is Travemunde Week, for more info check www.formula-18.de.